Sea Fu ... offering outdoor and indoor seating. THE recently opened Four Seasons Resort Dubai at Jumeirah Beach in Dubai, UAE, features three restaurants designed by Adam D Tihany, marking the first-ever design collaboration between the hotel chain and the leading hospitality designer. Known for creating luxurious hotel interiors and signature dining, Tihany has designed three of the 10 restaurants and lounges located at the 237-room hotel. These include the Suq, Sea Fu and Mercury. Suq, the all-day dining restaurant, has been conceived as a family-friendly contemporary take on the versatile Arab food market. The long corridor at its entrance displays all the market stations. Here, guests can stroll and sample a variety of international cuisines while dining below a gently vaulted ceiling that evokes the lively open-air market experience. Windows framed by light sheer fabric and wood-panelled walls create a fresh and light ambiance. The terrace outside, with a mosaic-covered fountain at its centre, is dotted with orange- and beige-coloured umbrellas and a pergola that offer shade to the guests. Suq, the all-day dining restaurant. For Sea Fu, Tihany drew inspiration from the hotel’s seafront location. The restaurant offers outdoor and indoor seating and a bar area servicing the adjacent pool during the day. 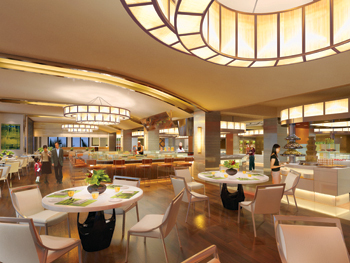 In the evening, Sea Fu transforms into an upscale fine-dining experience. Upon arrival, guests are welcomed by a metal relief wall sculpture. The interior is thoroughly modern and inviting with sleek, dark furnishings, tilted wood ceiling, wooden floors, and a decorative patterned screen connecting the space to its alluring landscape. A central fabric chandelier glows above a display table and creates a chic, warm, and sophisticated ambiance. 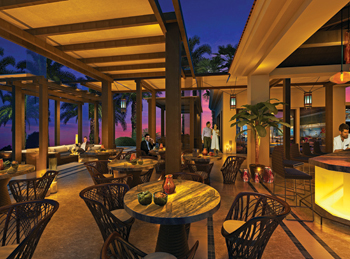 Outside, the bar emits a soothing evening glow and sits below a series of hand-blown glass chandeliers. The intimate fireplace and lounge pit close to the sea shore offers a relaxing space with stunning views, suitable for parties and late-night refreshments. Mercury is a dynamic rooftop bar and lounge, which provides guests with impressive views of both the urban skyline and sea. The central focal point of the venue is the impressive ice bar, designed by Tihany as a sphere sitting on a raised wave-like, mosaic-finished platform. A secondary bar counter also complements the service. 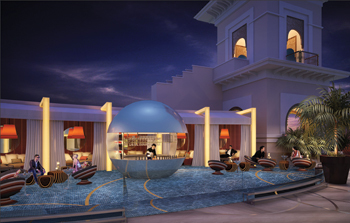 The open terrace, enhanced by marble flooring circled with metal inlay, is defined by contemporary lounge areas: guests may enjoy exclusive private cabana seating illuminated by light boxes, while the vibrantly styled indoor majlis rooms can host private events. Mercury ... impressive views of the sea. The three restaurants all feature custom-designed furniture and furnishings and a collection of artwork by New York artists Bram Tihany and Harri Kallio, which pays homage to the venues’ contemporary and cosmopolitan nature. “The primary materials in Suq are polished stones (lineas and walnut brown), Macassar Ebony millwork, and oiled-finished timber flooring in the dining area. All materials were locally sourced,” says Tihany. Sea Fu features different stones, including elegant brown marble for the open kitchen counter, azul bahia granite for the outdoor bar, and exterior limestone paving. The interior also displays polished walnut millwork. Sleek Linac marble flooring dominates the space in Mercury, and the raised platform at the centre of the venue is finished with custom glass mosaic designed by Sicis. The furniture and furnishings are all custom designed, except for the Mercury lounge area, which incorporates a blend of different off-shelf items. Custom light fixtures were supplied by Ricardo Lighting, outdoor seating by Walters Wickers, indoor seating by Colber, and tables by Fleetwood Furniture. Work on the project began in 2011 and the resort opened in November 2014. With convenient access to the main commercial district on Sheikh Zayed Road, Four Seasons Resort Dubai at Jumeirah Beach is located on a prime 11­-acre (4.45 hectare) natural waterfront site along the Arabian Gulf. It has been designed by world-renowned architect WATG, with interior design by San Francisco-based Bamo. Tihany Design was selected by H&H Investment and Development, the development manager of the property, to design the three venues. Commenting on the decision to appoint Tihany to design the outlets, Shahab Lutfi, CEO of H&H Investment and Development, says: “In recent years, Dubai has witnessed the entry of a host of international restaurant brands in this sector, in addition to restaurants with celebrity chefs, making the market very competitive for five-star restaurants. In addition to finishing the assignment at the Four Seasons Dubai, Tihany recently completed Bar Boulud at Mandarin Oriental Boston in Boston, US, which is his third collaboration with chef Daniel Boulud, and Oro Restaurant at Belmond Hotel Cipriani in Venice, Italy. Currently, he is designing a 100-room five-star luxury boutique hotel at the Dubai International Financial Centre (DIFC). He has also set his sights on the seas, and his visionary and innovative design concepts for the next wave of Holland America Line and Seabourn vessels – which are making their debut in 2016 and 2018 – are expected to be the ultimate in ultra-luxury cruising.